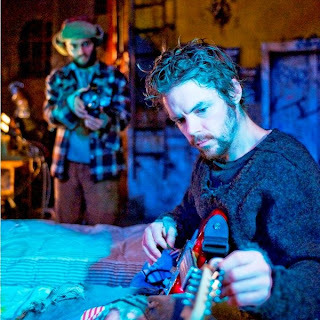 he hasn't played in a year in David Cromer's production of "Rent" Photo by Michael Brosilow. In theater, much like in real estate, it’s location, location, location when it comes to whether or not it is worth paying the rent. Take the American Theater Company and About Face Theatre’s co-production of Jonathan Larson’s Tony and Pulitzer prize-winning musical running through June 17 at ATC. Transported out of a 1990’s era lower east side of Manhattan, the musical based on Giacomo Puccini’s “La Boheme” probably wouldn’t work. That isn’t to say we approach the material with reverence. We certainly aren’t the same two people we were when we saw the original cast and it is only right that the show evolves, too. I only had to look at chalkboard in the lobby with a user guide explaining what “antique” relics such as AZT were (because, you know, people don’t take AZT any more, right?) to know that the times of “Rent” have changed. You couldn’t even get a martini on the lower east side in 1997. Now, one will set you back $15 during happy hour (but I digress). Angel (Esteban Andres Cruz) and Roger (Derrick Trubly). This brings me to David Cromer’s gritty production. The proceedings are grounded in realism. Unlike a Broadway production in which the starving artists all still manage to have perfectly coiffed hair and outfits that look like you couldn’t afford them, Cromer’s vision of the starving artists and misfits of Avenue B actually look like they all could be an eviction notice away from being homeless or a needle away from an overdose. Introspective, would-be Avant-garde film maker Mark Cohen (an appropriately understated and slightly neurotic Alan Schmuckler) is exactly the kind of guy you used to see reading obscure books in the back of your college coffee shop. Roger (Derrick Trumbly) is the former pretty boy front man of a rock band whose looks (and voice) are fading. Mimi (a terrifically fierce and passionate Grace Gealey) very much looks the part of a teenaged dancer lured by the seductive dream to make it big in the Big Apple who turns to stripping and heroin when her dreams don’t come easy. 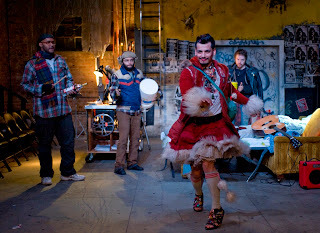 Angel (Esteban Andres Cruz) really does wear outfits that one imagines might be assembled via dumpster-diving clothing by an inventive, homeless drag queen. Performance artist Maureen (Aileen May) comes across as an artist whose performances don’t always match the potential of her concepts. Only professor Tom Collins (Alex Agard) and attorney Joanne (Lilli-Anne Brown) remain unchanged from their original Broadway counterparts. In the real world, starving artists, junkies, professors, attorneys and the homeless don’t usually sound like professional singers. In a bit of added realism, we’re being asked to accept a Roger whose voice cracks on some of the score’s many high notes and a Maureen and Angel whose ranges (alto and baritone) don’t match the musical’s score (a belting mezzo soprano and falsetto tenor, respectively). Most noticeably, Angel’s second act solo “Take Me” is actually performed by a ensemble member Anji White while Cruz (who is otherwise fearless and fierce in his performance) flails about in what can only be described as a dimly-lit piece of interpretive dance that robs the audience of the impact of (spoiler alert) his character’s demise. The show’s biggest misstep, however, was the decision to use a traverse stage in which the audience sits on two sides facing each other. Much like when utilizing theater in the round, traverse staging requires the actors to play to both sides equally. That didn’t happen in the performance I caught and the fault lies with the show’s director, not the cast. I had the misfortune of being in section B and spent most of the two-and-a-half hour musical watching the backs of actors’ heads as they played to the other side. Not exactly riveting theater. In group numbers like “Seasons of Love” that featured the ensemble singing to both sides, the vocals didn’t seem to be blended (I had mostly baritones singing in front of me, so that’s the only part I heard). There was one pay-off. Mimi’s first act solo “Out Tonight” was just to the right of me. Friends in section A and E complained afterward that they couldn’t hear anything she sang during that number, but Gealey’s performance was electrifying from where I was sitting. In fact, Gealey has the distinction of being my favorite Mimi (no offense to the original Broadway Mimi, Daphne Rubin-Vega). Had I been sitting somewhere else, apparently that may not have been the case. Gealey also impressed when she managed to make a moment out of a guitar accidentally falling off of Roger’s sofa during “Light My Candle.” Most actors would have just picked up the guitar and returned it to its original resting place, but Gealey worked with it in the moment, using the guitar as a sort of peace offering to the cowering Roger. Such a spontaneous event can make for a powerful moment in live theater and such was the case here. So, is it worth paying this “Rent?” I can’t say I’d recommend it, particularly if your theater seat is located in section B. Other locations? Who knows? Location, location, location.